DWG to Image Converter 2002 is an AutoCAD Addin that convert DWG to JPG, DWG to PNG, DWG to TIFF, DWG to BMP, DWG to PS easily. Its easy-to-use interface allows you to create the image files by simply click the "Save as Image" in AutoCAD. DWG to Image Converter 2006 is an AutoCAD Addin that convert DWG to JPG, DWG to PNG, DWG to TIFF, DWG to BMP, DWG to PS easily. Its easy-to-use interface allows you to create the image files by simply click the "Save as Image" in AutoCAD. ABC Amber AutoCad Converter is an advanced tool to convert your DXF (AutoCad) files to any graphics format you wish (BMP, WMF, EMF, ICO, JPG, GIF, PNG, TIFF, PCX, PCC, DCX, PBM, PGM, PPM, TGA, etc). Does not need AutoDesk AutoCAD to be installed. Office2CAD is a tool for importing Excel spreadsheet and Word text into AutoCAD and MicroStation. .
FlashSnap is a replacement for the standard AutoCAD Object Snap dialog. FlashSnap lets you control and manage easily and fast your snap modes without the need of using the dialog box. Chronos for AutoCAD - Time Logging Utility for AutoCAD, Job Logger, License Manager. Chronos will log all users that access AutoCAD drawing files and provides comprehensive reporting tools for documenting AutoCAD usage. DwgPlotX is an AutoCAD batch plot tool which bears a simple windows explorer style inteface to select files. In addition to plotting, it can also bulk replace strings/texts in dwg files or export them to many formats. An add-on for AUTOCAD 2002-2018 or BricsCAD V15-V17, which determines the unfolded section of one set of 3DSOLID, 3DMESH or 3DFACE entities and vertical planes passing through a 2D POLYLINE which may contain arcs, in XOY plane. 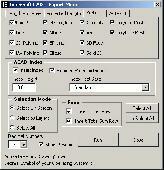 An application for AUTOCAD 2002-2012, which determines the intersection curves between 2 sets consisting of 3DFACE, 3DSOLID or 3DMESH entities. It can also generate cross sections to a POLYLINE and can draw the conversion to 3DFACE of the 3DSOLID.